Ready to find a home! 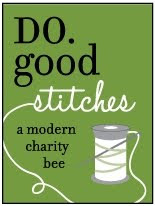 I used variageted thread again. I really like the tones of lavender to dark purple. It makes the purple background a bit more exciting and seems to show off my swirl a bit more. I love the bat quilting! I am so glad I went with FMQ instead of a pantograph. 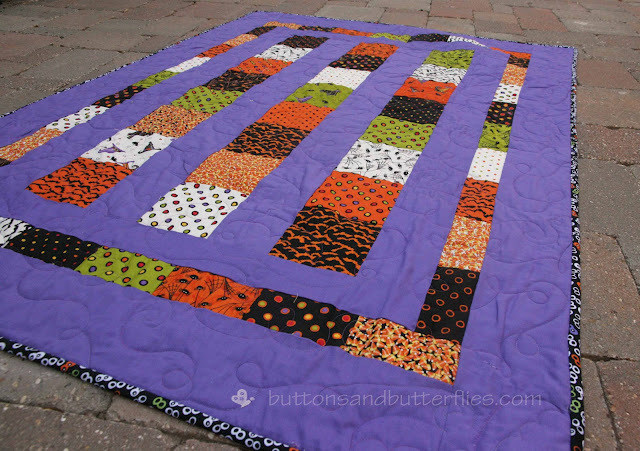 This quilt really rebelled against dense quilting! I tried my hand at a spider. He is solo in this quilt. I just didn't love him as much as the bats! I left him because I think he is a nice surprise. I found this cool looking fabric for the backing and binding. The design reminds me of Jack-o-lantern smiles. The colors matched the Deb Strain charm squares perfectly. The googly eye fabric was fun and had all the main colors also. I love how it pops on the front with the purple. 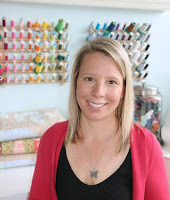 Why haven't I used my embroidery machine for the quilt label before? I have NO idea. I plan to do so in the future. I am so sick of worrying about labels that I have printed on. I even was able to digitize my little butterfly logo!!! 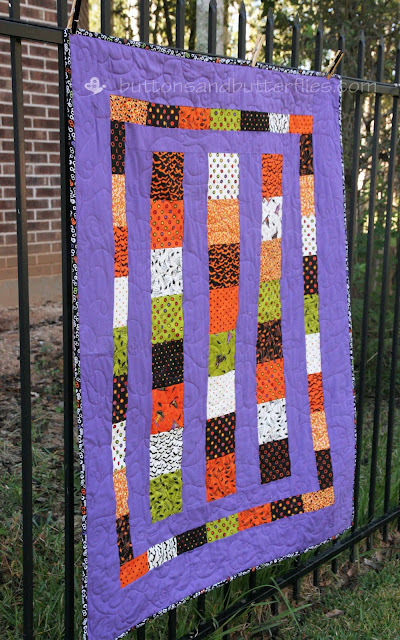 Pattern: Moda Bake Shop Tutorial: Line Baby Dance Quilt. 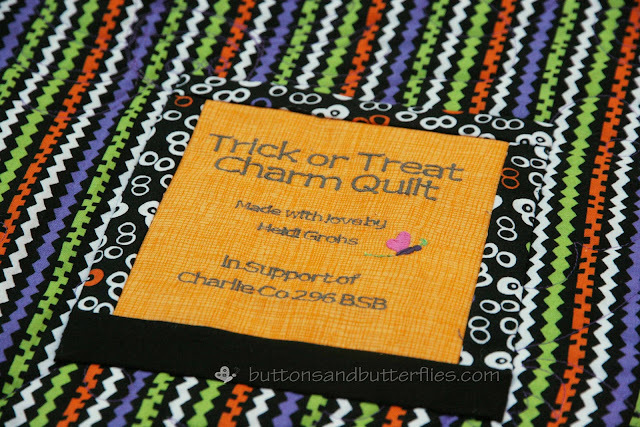 Adjustments to Pattern: Added one charm square to each row and vertical rows. Overall? I am pretty thrilled with this quick quilt using charm squares! It is off to my sister for her auction! Have I mentioned that it has gotten me in a WICKED mood! 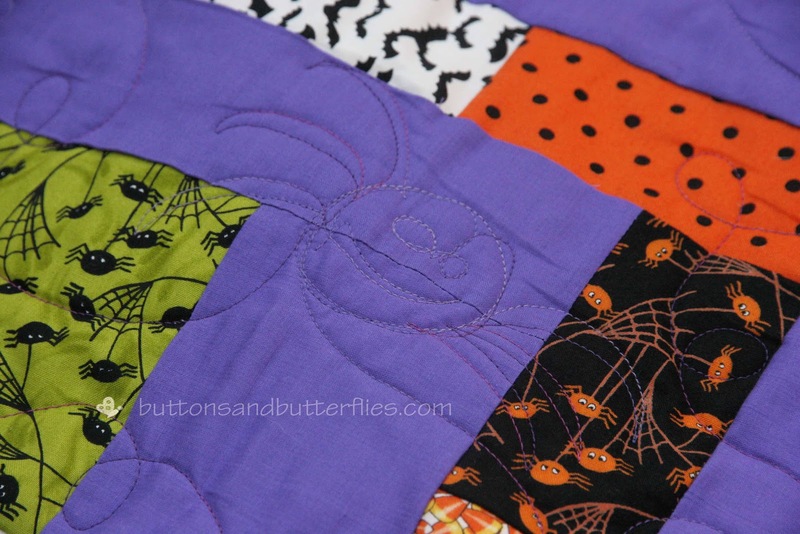 I will be joining the blog hop on HALLOWEEN DAY...I have a block tutorial in the works that you just might like! In the meantime....click on the Haunted House image to follow the blog hop. I hear their might be goodies, not to mention some great block tutorials. 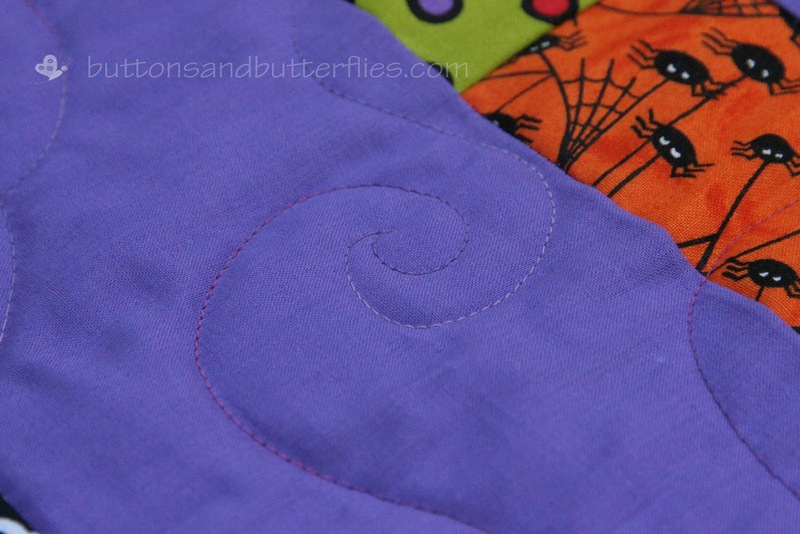 Anyone else getting Halloween quilts done? If not, I promise...this was a great quick one! I love it! 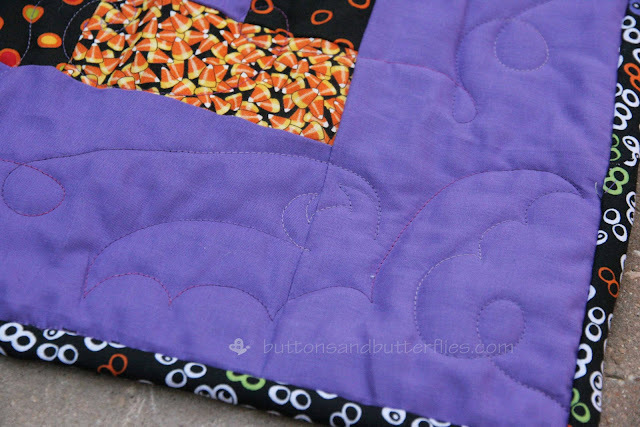 It's so cute and the bat quilting adds so much. Even the spider is so cute. Great job, Heidi! This is so cute, Heidi! The bat FMQ is totally awesome. I like your label too! I'm going to have to make some like that...my regular machine does small text embroidery and I've never used it because it's so small. But duh, perfect for a label! Your sporadic bats look great!! You did a wonderful job FMQing them! I love the hidden spider too-so fun to come across something unexpected. Love the way this quilt has turned out, and your quilting is Wicked! The quilting is fabulous! The backing is perfect and I like that googly eye fabric. Very cute! LOVE, LOVE, LOVE what you did with the quilt label. The butterfly came out wonderfully! This is so cute. And I LOVE your quilting.